Traders react after the closing bell on the floor of the New York Stock Exchange (NYSE). Technical analysts say more bullish signs for stocks are showing up in the charts. “It should open the door to 2,800 now…It does feel like the advance/decline line is really strong. The broad-based rally is strong. We have two days of overseas markets rallying. It doesn’t seem as if it’s a fake out for now…The active bulls keep stepping up where they have to,” said Scott Redler, partner with T3Live.com who follows the market’s short-term technicals. Advancers led declining issues by three-to-one on the New York Stock Exchange Tuesday. “It was another obstacle that this wall of worry got above,” said Redler. He said traders became more confident when the S&P 500 regained the psychologically important 2,700 level on Friday, and now that the S&P has regained the 200-day, it is signaling more gains ahead. Stocks were higher Tuesday amid optimism for the China trade talks and a tentative deal to avoid a government shutdown. Srategas Research technical analyst Todd Sohn said the more time that passes, the less likely it is the S&P 500 will retest the December lows. “You could get a pull back to 2,550 to 2,600, and that may be all you need,” he said. “I do like what I’m seeing. It’s important to remember the S&P is up 17 percent over 32 trading days. It’s a really good run, and I don’t want to stand in front of it but at some point, it’s going to need to pause for more than two or three days,” said Sohn. 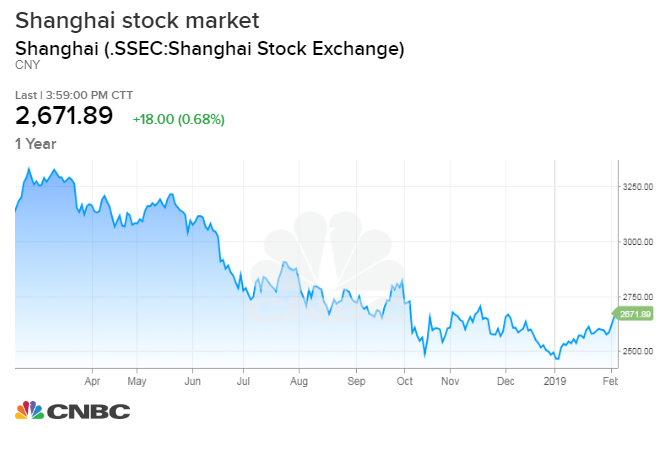 Robert Sluymer, technical analyst at Fundstrat said there are broader moves afoot that are signaling the U.S. stock market has put in a bottom and is likely to keep moving higher, even with choppiness along the way. One of those was the reversal by the Shanghai stock market, which led the sell off in global markets. Sluymer said Shanghai reversed the 2018 downtrend going into the Chinese new year, and it’s continuing to follow through. Growth is leading to the upside in the U.S. mid-cap range, also a positive. “Mid-cap growth versus value is making all-time highs,” he said, pointing to the Russell mid cap indexes. As for the S&P, Sluymer watches the 200-week moving average and says that the S&P bottomed there in December. “We think that was a cycle low, similar to what we saw in 2016 and 2011,” he said. The Philadelphia Semiconductor Index, SOX is up 2.6 percent week-to-date and 10.2 percent over the past month. It is 15 percent higher since the start of the year, even though the group continued to issue earnings warnings during fourth quarter reporting season. JP Morgan technical strategist Jason Hunter said he expects the S&P 500 could take some time to move past current levels but it should resume its move back to the highs. The move in semiconductors is an important part of it, and semiconductors were among the first to respond to global growth worries. Hunter said the semiconductor group could act as a leading indicator for global manufacturing. “We expect those groups to maintain their leadership through the first quarter; however history suggests other markets transition to leadership positions if and when the data starts to validate the improved risk market performance,” he wrote. Hunter said the semis ignore poor fundamentals, but other assets like bonds and financial stocks only seem to reprice aggressively once the data starts to improve. If the outperformance in the SOX Index actually is signalling a bottom in global manufacturing PMIs, financials should then take a leadership position, he noted. “Based on the recent SOX Index performance, that index’s historic relationship with the PMI data, and the known base effect for the year-over-year performance through the first half of 2019, we suspect the PMI trajectory can start to improve into the second quarter,” Hunter wrote. Strategists had been looking at the fact that both bonds and stocks have been moving higher, an unusual move recently. Stocks paused for several days before moving higher, while yields have been fairly flat. Yields move opposite price. Yields retreated after the Fed sent a dovish message that it would likely pause in its rate hiking cycle. That was bullish for stocks. “I wouldn’t mind seeing yields higher here,” Sohn said. “I would like to see the 10-year get a little boost. Part of that has to do with what’s going on abroad. 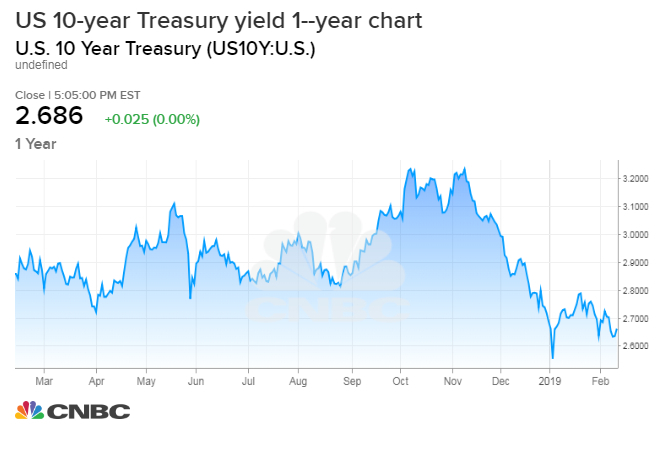 German 10-years are yielding just 13 basis points at this point.” The U.S. 10-year was slightly higher Tuesday at 2.68 percent. Hunter notes the 10-year yield is trading in the middle of its early 2019 range, with key medium-term resistance near 2.5 percent and initial support near 2.8 percent. “The range can hold into March, but we expect it to bearishly break into the spring and for yields to back up toward key medium-term support clustered near 3.00%. That is our base-case mid-year target,” he wrote.